Not being prepared is no excuse to derail your keto efforts. Make sure your fridge and pantry are stocked with these keto-friendly foods! Let's face it: Sticking to a ketogenic diet ain't always easy. Trying to restrict yourself to no more than 50 grams of carbohydrates per day is a challenge, to say the least. And although it can be hard enough staying keto while dining out—though it's not as hard as you think—one place it should be easier is your own home. By keeping your freezer, fridge, and pantry stocked with keto-friendly staples, you'll always have something suitable on hand. Sure, you may not want another roasted chicken thigh covered in homemade guacamole, but having keto essentials on hand will prevent you from falling face-first into a pile of pork-fried rice from the Chinese takeout. Stack the deck in your favor and keep your kitchen keto-friendly with these foods. Protein: If you really want to support a keto diet for the long haul, stock your freezer full of keto-friendly staples. All the traditional animal meats are fair game, and don't hesitate to buy the fattier versions! Not only will they support your keto efforts, but they'll also save you some cash. Vegetables: Be careful when buying frozen veggies—don't select the ones that are breaded or swimming in sauce. Keto-friendly examples include broccoli, Brussels sprouts, cauliflower, asparagus, spinach, and collard greens. Dairy: Finally, a diet where butter, sour cream, heavy cream, and lots of cheese are not only acceptable, but encouraged. Cow, goat, sheep, blue, cheddar, jack—nearly any cheese is great. Full-fat Greek yogurt can also make a regular appearance in your nutrition plan. A half-cup of plain, naturally fermented yogurt contains only 5 or so grams of carbs. During the culturing process that turns milk into yogurt, the lactose (milk sugar) is converted into lactic acid. This gives yogurt its sour, tangy flavor and doesn't raise insulin levels or interfere with ketosis. More Protein: Eggs should be a staple. The sell-by dates on these things are a bit restrictive; eggs last a long time in the fridge. And don't forget lunch meat, especially pepperoni, salami, and bologna. Low-Carb Vegetables: If you're bored on a ketogenic diet, you're probably eating the same two or three vegetables at every meal. Expand your horizons! Fill your fridge with broccoli, Brussels sprouts, spinach, salad greens, mushrooms, celery, cauliflower, bell peppers, onions, jicama, radishes, fennel (aka anise), zucchini, yellow squash, cucumbers, asparagus, cabbage, and eggplant. 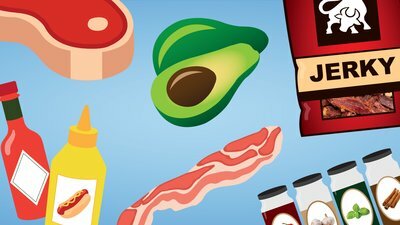 Condiments and Toppings: Focus on full-fat options. Mayo, blue cheese, and ranch dressing work well. Double check the carb content before buying your favorite sauce. Mustard and hot sauce work well, too. And be sure to always have olives and pickles on hand, as these pair well rolled up in fatty salami or tossed in a salad. Fruit: Don't forget the fatty (in a good way) avocado. Not only is this fruit rich in essential fatty acids, but roughly 75 percent of its carbohydrates are fibrous, so its net carb total comes in just under 5 grams per medium avocado. It'll definitely keep you keto. Raspberries, strawberries, blueberries, and blackberries make wonderful sweet treats on occasion. Mix them with coconut milk or heavy cream for an awesome keto dessert. Keto Icing on the Cake: A jar of bacon fat. You do save the fat when you cook bacon, right? Right? Herbs, Spices, and Flavorings: Anything without sugar, cornstarch, or dextrose is fair game. Examples include garlic powder, chili powder, curry powder, turmeric, cumin, paprika, basil, oregano, thyme, sage, rosemary, ginger, cinnamon, salt (this is essential, especially during a keto diet), and pepper. All forms of vinegar, soy sauce, and fish sauce are great, too. And artificial sweeteners won't kick you out of ketosis like sugars do. Nuts, Seeds and Snacks: Stick to plain or salted nuts, and watch out for honey-roasted and other flavorings, as these can be laden with sugars. Pork rinds are a delicious chip substitute to have on hand as well. Dip them in guacamole or sour cream, or use them for breading on chicken or fish in place of bread crumbs. Protein: Beef jerky (avoid the sugary flavors), canned fish (tuna, salmon, sardines, mackerel) and dried and cured sausage and salami provide a portable, travel-friendly option. If you have a protein powder on hand, make sure it has 3 grams or less of carbohydrates per ounce of powder. Oils: Olive and coconut oils are great fat sources to have on hand, but also consider duck fat, lard, or beef tallow. MCT oil is also an excellent keto option to have around. Shelf-Stable Liquids: Keep coconut milk in your pantry for homemade curry or to add to your coffee or protein shake. Sugar-free syrups (such as DaVinci or Torani) pair well with coffee, cottage cheese, and yogurt. Dessert: Eat straight unsweetened chocolate if you can handle the bitterness, or combine it with coconut oil and sweetener for a homemade chocolate treat. You can also eat 85 percent cocoa; a square or two won't kill your keto. Jeff Volek and Stephen Phinney. The Art and Science of Low Carbohydrate Performance. Beyond Obesity, LLC, 2012. pp. 57-58. Amy Berger, MS, CNS, NTP, has a master's degree in human nutrition and is a certified nutrition specialist and nutritional therapy practitioner.